In Future Trends: The end of weather forecasting we look at the trends that we should be aware of today, June 10th, 2016. How weather forecasting is changing, miniaturising engines, 3D printed aircraft, Hypotopia, and disruption in Paris. With iPhones and computer models, do we still need weather forecasters? From IBM’s perspective, humans will continue to be pushed out at both the consumer and business level. Computers will learn to interpret information, too, and provide guidance on activities. The role of humans will evolve into ever more complex decisions that require multiple sources or types of information, such as when it is prudent to order the evacuation of New Orleans in the face of a Gulf of Mexico hurricane. Complex decisions will incorporate both weather forecasts (made by the National Hurricane Center, but based almost entirely on computer model guidance) and human factors, such as how many buses are available and how long historical evacuations have taken. “There’s no doubt that the trend in the big picture is less of a pedigree on solely meteorology, and more of a pedigree on meteorology plus analytics or data sciences or other related areas,” Neilley said. “That trend is pretty steep.” That trend is also reflected in The Weather Company’s employment. In the part of the business that makes forecasts and produces them for customers, the employment ratio is about 4-to-1 non-meteorologists to meteorologists. The company prizes data analytics over forecasting skill. In the near future, Neilley said, the company will focus less on producing the standard 5- or 7-day forecast accessible on an iPhone and more on helping consumers make decisions such as whether they should, for example, cancel the family picnic this weekend or park the car in the garage tonight. The company is moving toward allowing customers to interact directly with the data, such as signing up for an alert when the winds are going to exceed 15mph. 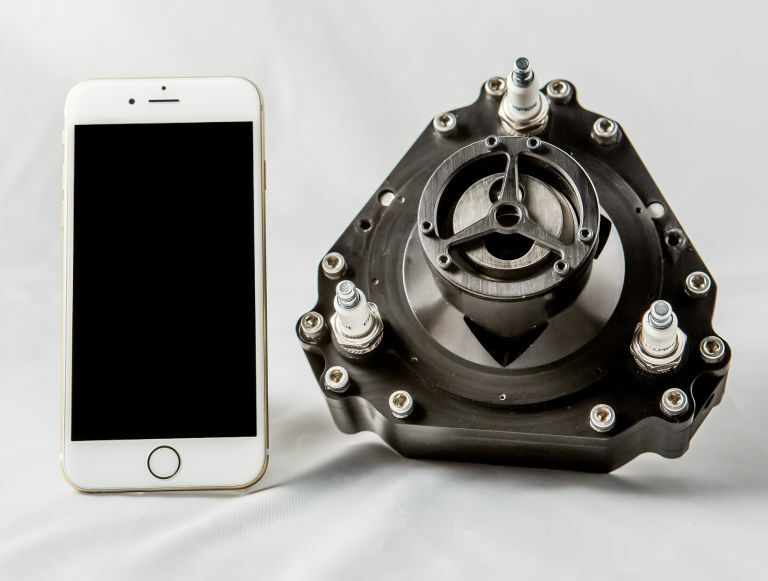 Connecticut-based startup LiquidPiston announced today that they have built a small, compact engine that is powerful enough to drive a go-kart. Their X-mini engine weighs just 4 pounds and has three moving parts, and yet can produce 3 horsepower, enough to replace the default 40-pound piston engine that normally powers the go-kart. LiquidPiston says that their X-mini is still in a testing phase, and they hope to get the weight down to 3 pounds and the power up to 5 hp. (The 40-pound piston engine produces about 6.5 hp.) In the meantime, their little engine already packs a punch, as you can see in the video below. If it’s possible to build complete products on one machine as effectively as traditional manufacturing techniques, without having to hire humans or robots to assemble them, then perhaps 3D printing could spur that “next industrial revolution” we were promised. And Airbus, one of the largest plane manufacturers in the world, is experimenting with what the future of aviation manufacturing might look like with 3D printing. Riots and demonstrations have gripped the continent’s capitals for the past five years of the eurozone crisis – but in Vienna, a group of innovative students are trying a different form of urban protest. Corrupt politicians, jailed banking bosses and alleged connections to shady mafia groups in the Balkans – the story of failed Bavarian bank Hypo Alpe Adria has been an ongoing catastrophe for Austria. But the largely passive public reaction to the €19bn bailout of this “bad bank” inspired a group of architecture, civil engineering and urban planning students to pose the question: what could you build with €19bn? Over four months, these students from the Technical University of Vienna designed and created a model city for the same price as the bailout in one of Vienna’s main squares, Karlsplatz, as a protest project that has captured the attention of the country. Amazon has brought its one-hour grocery delivery service to Paris, and the city isn’t thrilled. Prime Now is available to Premium subscribers who pay €49 per year (Prime is called “Premium” in France) with free two-hour deliveries and €6 for one-hour shipping. Besides groceries, the company will ship “thousands” of other products like Kindles and electronics. However, it’s the food deliveries that have Paris and its mayor, Anne Hidalgo, most upset. “This service could seriously destabilize the retail balance in Paris,” she says.